Launched in 2015, the original Slim d’Hermès is a modern dress watch – slim, clean, and lightly designed – and relatively formal in style. 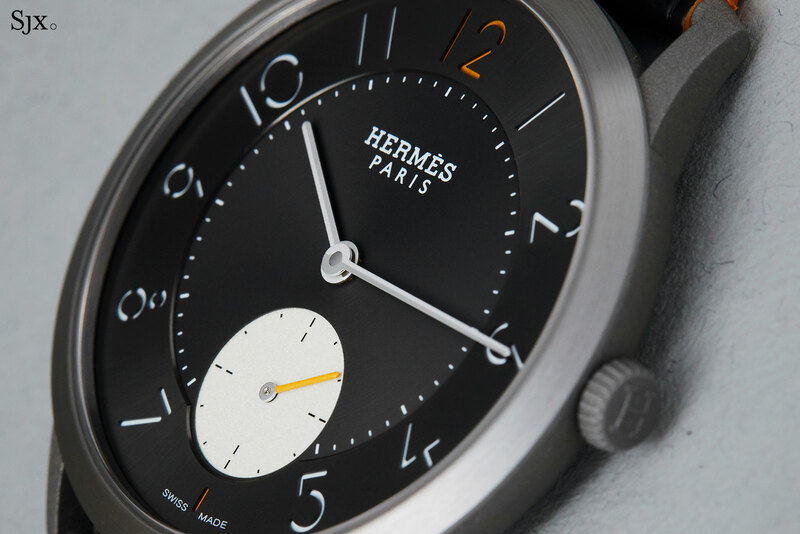 The Slim d’Hermes Titane, added to the line at SIHH 2019, takes a different tack. 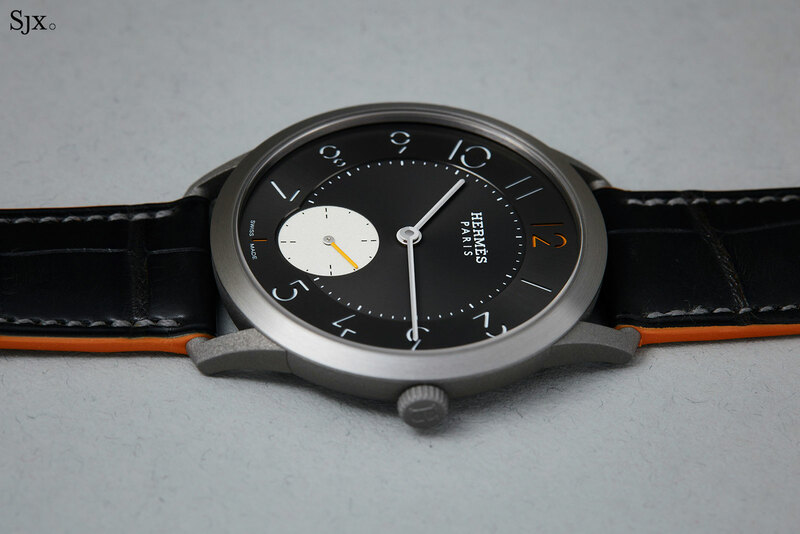 It’s light, modern, and sporty – and accented gently by Hermès’ signature orange – despite retaining the same clean design and signature custom typography by graph designer Philippe Apeloig. Hermès injected a hint of sportiness with colour, material and construction. The use of subtle details that combine to create something quite different, but nevertheless restrained, is typical of Hermès. Though the material is new, the case size is exactly the same, 39.5mm in diameter. Already a thin watch with a case 9.06mm high, the use of titanium makes the Slim d’Hermes Titane lighter than its steel or precious metal counterparts. It feels lightweight and elegant on the wrist. The case is simple, but it cleverly employs starkly contrasting surface finishing for an unusual and appealing effect. 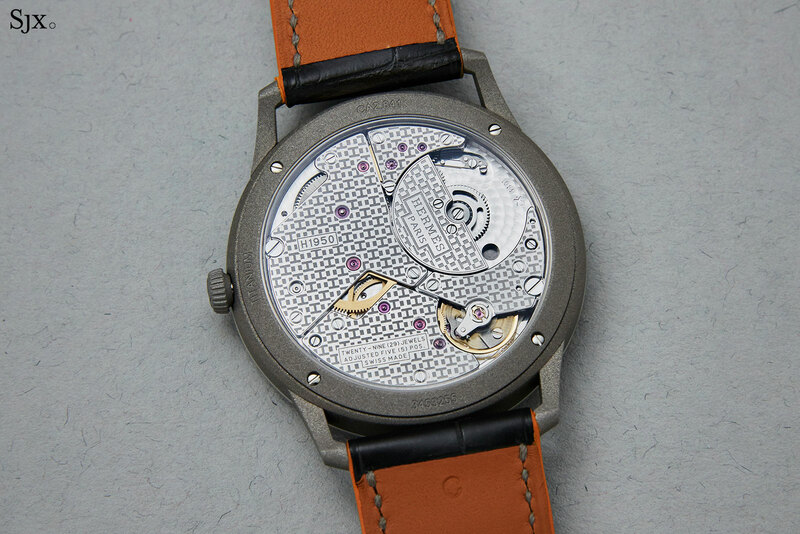 The bezel is finished with circular brushing (with the graining perpendicular to the radial brushing on the dial), while the lugs and case band have a granular, frosted surface. It makes for stark contrast between the two components, despite the material being identical. And it further helps frame the dial, and leaving the lugs to recede into the background. 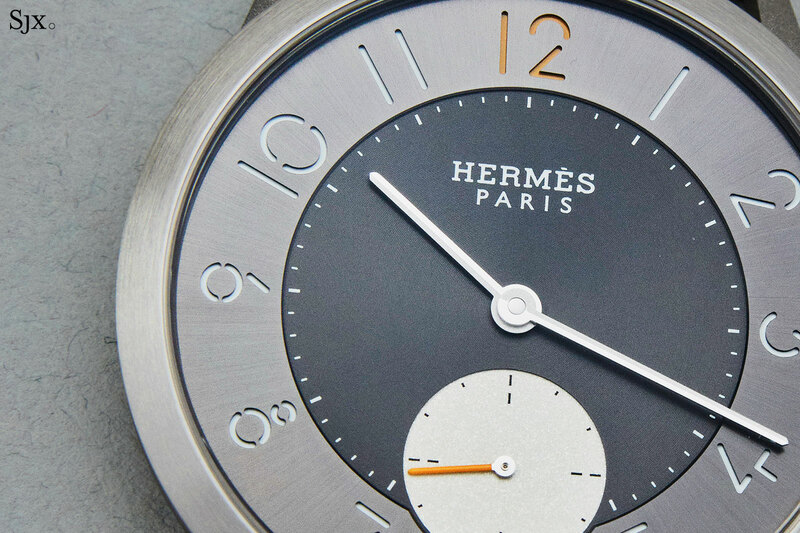 In a first for the Slim d’Hermès, the dial relies on a “sandwich” construction. 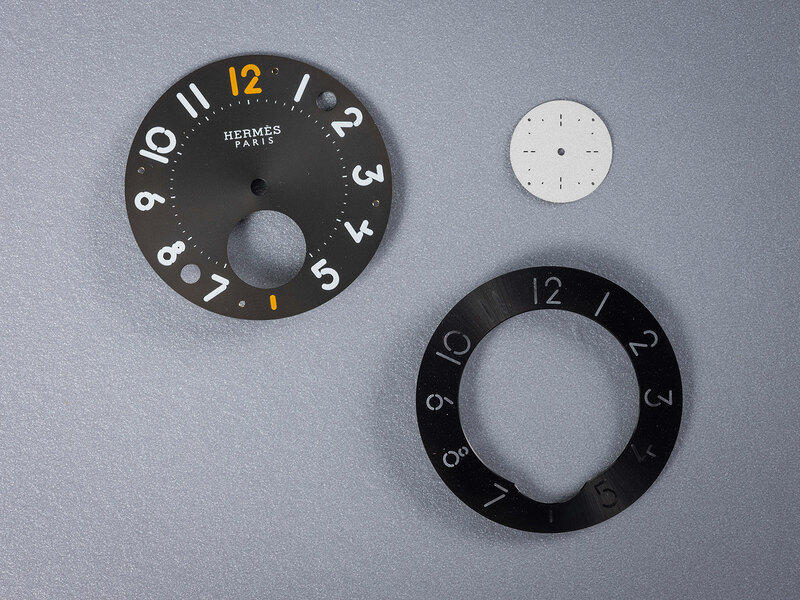 It’s a multi-level affair made up of three pieces – an anthracite dial plate printed with SuperLuminova numerals; a chapter ring open-worked for the hour numerals, further enhancing the stencil-like font; and the recessed small seconds. 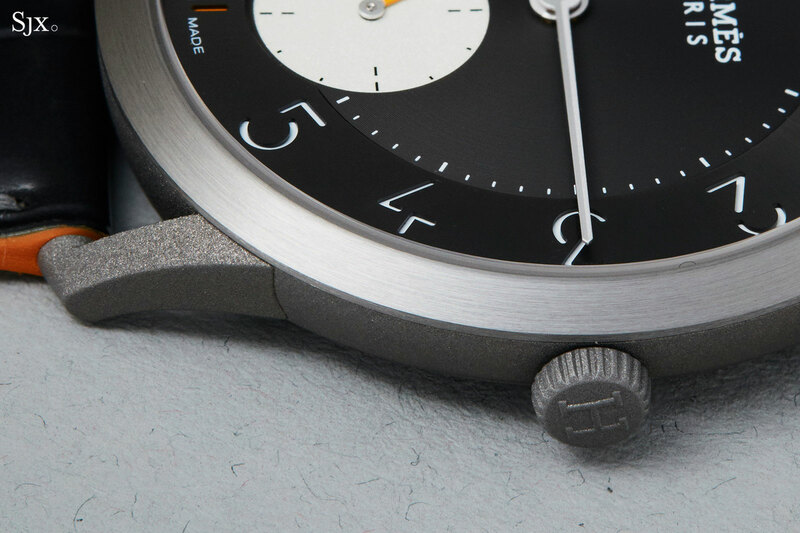 Like the case, the dial relies on contrasting surface finishes: sandblasted seconds counter, concentric azurage on the dial centre, and sunburst brushing on the chapter ring. Powering the watch is the H1950, essentially a VMF5401 automatic by Vaucher that’s been customised for Hermès, which owns a quarter stake in the movement maker (which is in turn majority owned by the charity that also owns Parmigiani Fleurier). The ultra-slim movement, just 2.6mm high, utilises a micro-rotor and has a power reserve of just 42 hours. 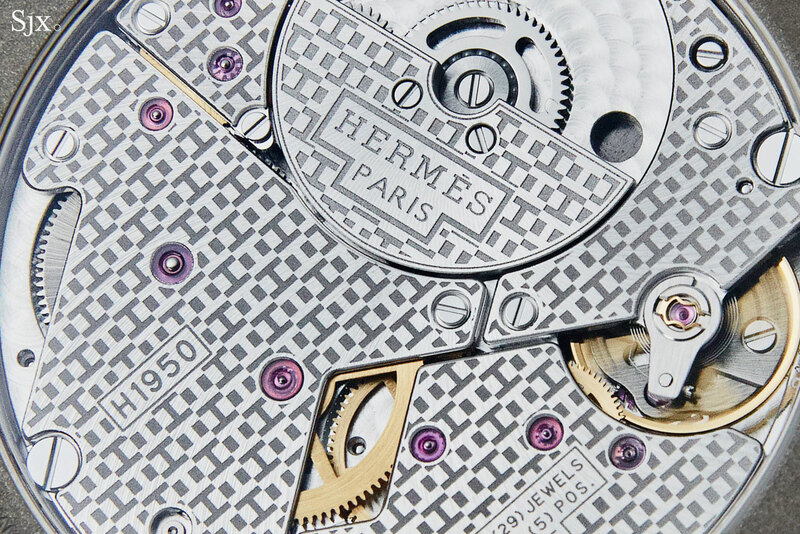 Like all of Hermès’ other “manufacture” movements, it’s finished with a stamped, repeating “H” on all the bridges and rotor. While the watch sits snugly and flat on the wrist, the expansive dial gives it wrist presence. And like Bulgari’s ultra-thin Octo Finissimo, the watch can be as a dress watch because of its dimensions, but at the same time the look is modern and casual. 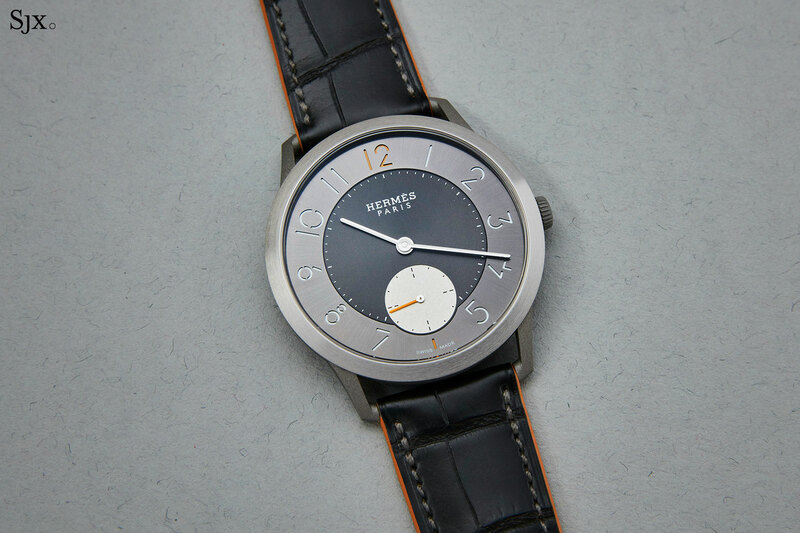 It costs only slightly more than the basic Slim d’Hermès in steel, making it a relatively compelling buy, since the basic model can look a bit plain. 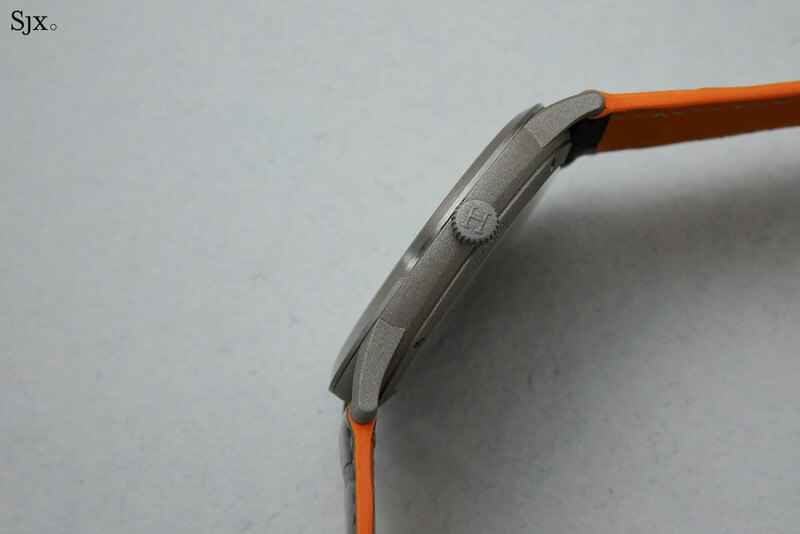 The Slim d’Hermès Titane is priced at US$8,050, or 7,100 Swiss francs.